WBA World super middleweight champion Tyson Zeuge (21-0-1, 11 KOs) won a 12 round unanimous decision tonight over #5 WBA Paul Smith (38-7, 22 KOs) at the Rittal Arena in Wetzlar, Hessen, Germany. Smith gave it his best shot, but he lacked the technical skills overcome the 25-year-old Zeuge, who controlled the fight throughout with his jab. Smith didn’t start attacking until the last 3 rounds when things were looking bleak for him. By that point, Smith needed a knockout, but it wasn’t going to happen. The scores were 119-108, 119-108 and 119-108. Smith stumbled and fell to the canvas in the 12th. It appeared that Smith was off balance rather than hit with a shot. The referee decided that Zeuge had caused the knockdown. Smith tried to protest, but the referee wasn’t having any of it and he counted it as a legitimate knockdown. Zeuge started off quickly in the 1st round in connecting with double jabs to the head of Smith. Zeuge was able to land his head-snapping jabs at will, as Smith wasn’t using any head movement to speak of, and he wasn’t walking to the shots. Smith needed to bob and weave his way into punching range in order to get hit, but he wasn’t doing that. Smith was plodding straight in and straight out. Smith landed a scorching right hand to the head of Zeuge in round 3 that appeared to shake him up a little. Smith failed to caplitize on hurting the German in 3rd. By the 4th, Zeuge was back in business in jabbing Smith with head-snapping shots. Smith had the power advantage, but he attacking enough to do anything with his power. Smith looked slow, and once-paced. He was unwilling to fight at a fast enough pae to give Zeuge any real problems. Smith came alive in the 9th round in landing some choice shots to the head of Zeuge. It looked briefly like Smith was going to get back into the fight. However, in the 10th, Smith continued to get over and over again by the hard jabs from Zegue. Smith couldn’t will himself to attack Zeuge in the way that he needed to for him to have a chance of winning the victory. All in all, it was a decent performance by the 25-year-old Zeuge. He got the win and showed that he’s got a great jab. With that said, Zeuge will have problems against WBA Super World super middleweight champion George Groves if the two of them ever face each other. Groves hits too hard, and Zeuge is too limited to do much more than jab. #4 WBA David Benavidez will be a big problem for Zeuge as well. Benavidez is pretty immune to losing controversial decisions due to his punching power, so we don’t see a repeated of Zeuge’s first fight with Giovanni De Carolis. 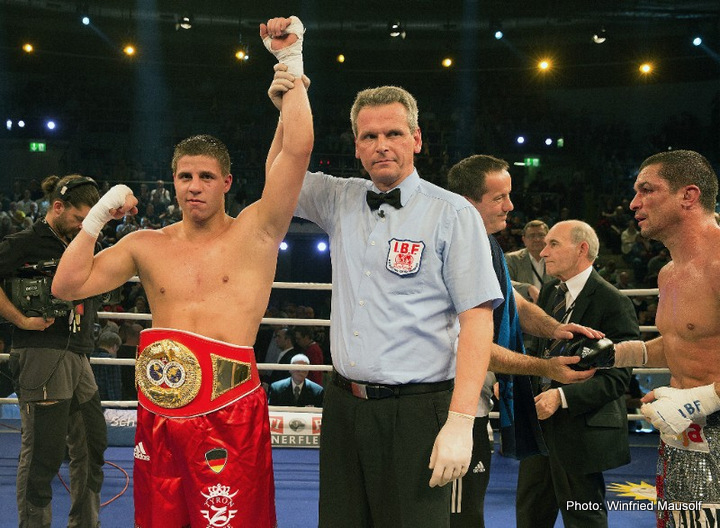 Zeuge fought to a controversial draw against De Carolis in their first fight. The magical question now is does Smith retire or continue on? Tonight’s fight for Smith was viewed as a last chance for him. The fact that he lost so badly in losing 11 rounds to 1 to Zeuge would suggest that is may be all over for Smith.